KIGALI, Rwanda — Gov. Gen. Julie Payette laid a wreath at a memorial in Rwanda’s capital today to mark 25 years since the start of a genocide that left an estimated 800,000 people dead. 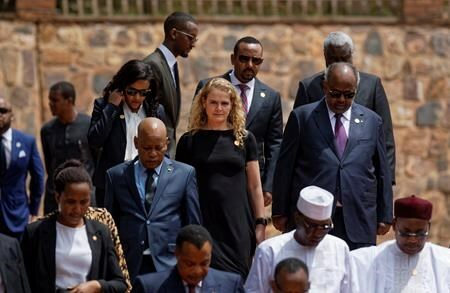 Payette, who is leading a Canadian delegation on a four-day visit to the east African country, visited the Kigali Genocide Memorial that is the final resting place of roughly 250,000 victims of the genocide. Sunday marks the 25th anniversary of the start of the ethnic slaughter of some 800,000 people, mainly members of the Tutsi minority. The mass killing of Tutsis was ignited on April 6, 1994, when a plane carrying President Juvenal Habyarimana was shot down and crashed in Kigali, killing the leader who, like the majority of Rwandans, was an ethnic Hutu. In a statement on Twitter, Payette offered the country’s sympathies to Rwandans as well as peacekeepers from Canada and elsewhere who “lost so much” in the ensuing massacre, which lasted until mid-July 1994. “During this time of mourning and remembrance, Canada offers its deepest sympathies to Rwandans and to those who served the cause of peace,” Payette wrote. He said the genocide showed the “unconscionable cost of division and hatred,” and urged Canadians to take time out of their days to remember the victims. “We can honour them by fighting hate, protecting the most vulnerable, and working to make our world a better one,” Trudeau said. In Montreal, several hundred people attended a ceremony and a march in memory of the victims of the genocide, the city said. The event began at a library and ended at the clock tower in the city’s Old Port area, where a wreath was laid in solidarity with the victims and their loved ones. About 5,000 Rwandans live in Quebec, 3,000 of them in Montreal, the city said in a news release.